“Bach’s B-minor Mass? Wow. That is the mountaintop,” says Grant Gershon. He should know. When it comes to choral music in Southern California, likely even the entire country, there isn’t a more prominent musician than the man who is both Music Director of the Los Angeles Master Chorale and Resident Conductor & Chorus Master of Los Angeles Opera. In 1964, the newly established Los Angeles Master Chorale gave its first ever concerts, under the baton of their founding Music Director, Roger Wagner. The work chosen to commemorate the occasion by the iconic choral conductor and Angeleno: the Mass in B-minor by Johann Sebastian Bach. In about a week from now – fifty years later, almost to the day, from that inaugural concert – the Master Chorale will once again perform the same work of music, and their current Music Director happens to be another Angeleno and iconic choral conductor in his own right. But that’s where the obvious similarities end. Whereas the LAMC founder had a larger-than-life persona, shown in publicity shots sporting a rakish moustache and smoking a pipe, its current leader is an Everyman, with a still-boyish face and casual demeanor that belies his position. When Mr. Gershon steps onto the podium, however, it’s clear that he’s meant to be there. During concerts, he elicits impassioned and consistently excellent singing from his troops, in repertoire ranging from choral masterpieces and familiar warhorses to world premiere performances and obscure works. In rehearsals, he gets exactly what he wants without ever raising his voice; an occasional “shhh” to quell some percolating chatter being the limit of any kind of admonishment, and even that is given almost conversationally rather than pointedly. He is consistently praised for his musicianship, knowledge, and dedication to his craft. 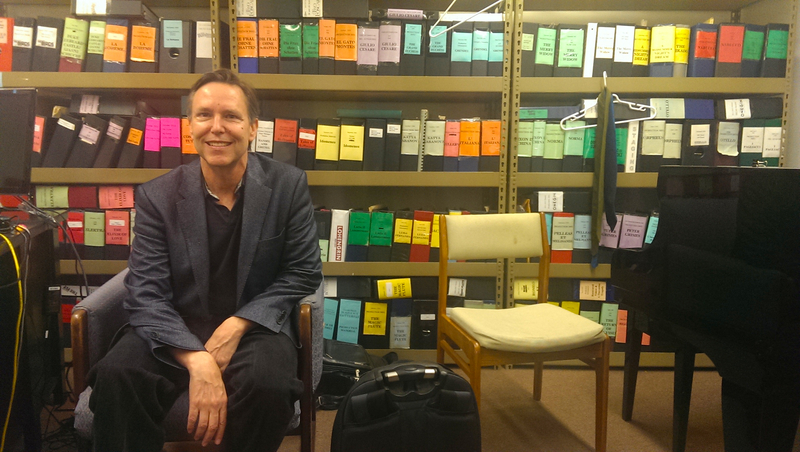 He’s managed to hold positions at all three resident music organizations of The Music Center of Los Angeles County. And yet, if not for a series of unlikely events occurring at the right points in his career, it may not have come to pass. He is quick to admit that conducting did not come easy to him, and he confesses that he almost gave it up as a career. Hard to imagine given his current success. With that in mind, I asked to spend some time with Mr. Gershon, and he graciously let me crash his world. We chatted first in his LA Opera office, a comfortable space with a grand piano, a couch, and a wall packed with binders of music for operas from Monteverdi to Daniel Catán and everyone in between. Pictures of his wife, soprano Elissa Johnston, and children share space with a framed shot of him and Frederica von Stade, not to mention a personal note from Nelson Mandela. Later, we talked more over lunch; on other days, I even sat in on rehearsals of Handel’s Messiah and the aforementioned Bach Mass. Here’s what I learned about his career, his approach to music-making, and the differences in his two prominent jobs. From a very young age, the combined influence of piano and song made an important impact on the Alhambra native. He would concentrate on the piano, becoming rather accomplished for his age. It wasn’t until his freshman year at Alhambra High School did that change. A rather public accident – the first in a series of unexpected incidents and opportunities throughout his life – would alter the course of his musical trajectory. Instead, his career took a different turn, albeit still related to vocal music. So that sparked his love for conducting, right? Not really – at least not at first. That conducting bug got even stronger when he began working with Esa-Pekka Salonen and the Los Angeles Philharmonic as the rehearsal pianist for the now-legendary Salzburg Festival performances of Messiaen’s opera, Saint François d’Assise. “Gershon acquitted himself well under the trying circumstances. He was knowledgeable, calm, prepared, steady — and cautious. . . . Still, he did not lack ideas, even if this was not an ideal opportunity to make his own views on the works known. He led the “Namensfeier” Overture with clarity, lightness and drive. He made Steven Stucky’s transcription of Purcell’s “Music for the Funeral of Queen Mary” transparent and dramatic. He accompanied Catherine Ro, the 18-year-old soloist in Saint-Saens’ Violin Concerto No. 3, with sensitivity and consideration. . . .
Not long after, and despite of how Mr. Gershon thought that night went, the LA Phil officially offered him the position of Conducting Assistant. He was later promoted to Assistant Conductor, staying on for a total of three years. But he didn’t. He stuck to conducting. During a rehearsal in Glendale earlier this week, as he put the Master Chorale through its paces in the Bach B-minor Mass, it’s hard to believe that he was ever that clueless at his profession. Mr. Gershon runs an extremely efficient rehearsal. There are no wasted moments, no dawdling over what to do next, or wondering how he wants his singers to approach an upcoming passage. Instructions about what kind of dynamics, phrasing, or philosophical approach are offered in a concise way. Even the context and history lessons he offers is purposeful. “While I give you a moment to rest your voices, let me tell you a little about this next section,” he says before giving a brief yet informative background about how Bach wrote parts of the B-minor Mass over the course of 25 years. For over two hours, he shapes and hones various interpretive details with precision. Yet he rarely gives corrections, despite an occasional shaky entrance here or bit of messy blend there. The section is repeated, after which he calmly says, “Yeah. I know some of you are seeing this for this first time, so I understand, and I offer mercy,” but gives no additional details on what to fix or how to fix it. One final time through the phrase, and what had been blurry was now clear. He smiles and offers, “Nice. Thank you,” and he’s immediately on to the next section. Eventually, his tenure with the LA Phil ended, and he and his wife decided that moving to New York would better serve their careers. By then, he had made the transition from pianist to conductor, continuing to work with Mr. Salonen on projects like Ligeti’s Le Grand Macabre, as well getting offers to be an assistant conductor in Europe. One of those offers came from Daniel Barenboim. About the same time, Mr. Salamunovich announced his retirement, and the Master Chorale found itself hunting for a new Music Director. Mr. Gershon became a candidate, flying back and forth from Berlin for the interviews. He was wrong. In the summer of 1999, he got rave reviews in preparing the Master Chorale for their role in a performance of Prokofiev’s Ivan the Terrible with the Los Angeles Philharmonic at the Hollywood Bowl. Less than a year later, Grant Gershon was offered the job as their new Music Director. But the LAMC had competition. “It was so funny. . . . When I got the call offering me the position, either the day before or the day after I got a call from Daniel Barenboim offering me the permanent position of Assistant Conductor at the Staatsoper Berlin.” Positions like this are typically a key step in a conductor’s career and are therefore highly coveted. Tags: Ernest Fleischmann, Esa-Pekka Salonen, Grant Gershon. Bookmark the permalink.